NOTD: Dollish Polish - It&#39;s A Me Mario! I've got a Dollish classic for you today in the form of "It's A Me Mario! (and yes I'm saying it in his little high pitched voice, hehe). This polish is red and blue glitters, alongside slightly larger red and blue hexes AND my favourite, STAR GLITTERS. The stars are actually holographic too. The glitter itself spread evenly enough and I used 2 coats, the stars did require a little fishing and dabbing though. 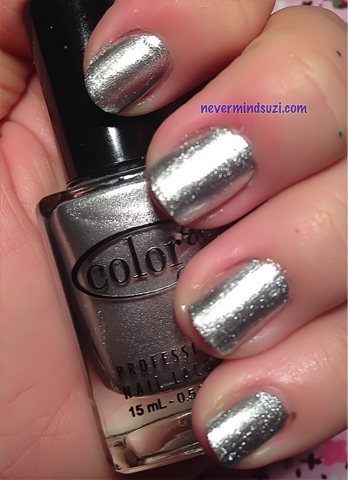 I chose Color Club - On the Rocks, a silver foil that was pretty much opaque in 1 coat but I went with 2 as usual. The red and blue really stand out here, the stars not so much, I think I'd like to try this over black the next time. Definitely a keeper and I'm glad I was able to nab it before it was discontinued!